Recognized by the Guinness Book of World Records, the Bugatti Veyron is the fastest street-legal production car in the entire world. For many, the Veyron is the ultimate supercar: it’s blistering fast, extremely luxurious, expensive, and it looks really good. Developed by Volkswagen and produced by Bugatti Automobiles S.A.S. in France, the Veyron has been the king of supercars ever since it first came out in 2005. Unfortunately the last Veyron that was ever made was debuted at the 2015 Geneva Motor Show recently. In total, 450 Veyrons were produced and they came in many different flavors and versions. 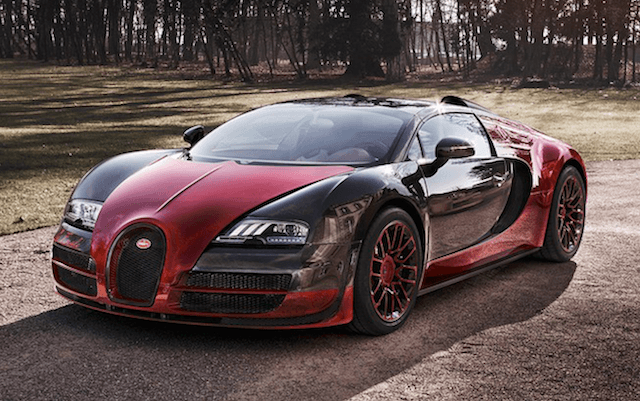 So we are going to look at the top ten Bugatti Veyron models of all time. This particular Veyron was produced in 2008 in collaboration with the fashion label Hermes. The car was obviously extremely luxurious and stylish, and it was a favorite at the time. This Veyron featured new eight-spoked wheels withe the Hermes “H” in the center. The grille of the Veyron was made from many H’s and this Veyron had a price tag of $2.3 million making it a bit more than the standard version. This modified Grand Sport Vitesse Veyron was unveiled in 2014 as part of Buggati’s “Legends Edition” series. This Veyron took design influences from the Bugatti Type 18 Black Bess of yesteryear, and is certainly an attractive vehicle. Aside from the design, this Veyron has a 8.0 liter W16 engine that produced a crazy 1,184hp. Only three of these Black Bess Veyron’s were produced and they were priced at nearly $3 million dollars. Released in 2009 to celebrate the 100 year anniversary of the brand, this Bugatti is another one of our favorite models. This model was based on the first Veyron’s that came out in 2005. While this particular version wasn’t anymore powerful than the other Veyrons of the time, Bugatti managed to shave off 200 pounds of extra weight from this model so it performed a whole lot better. The exterior features matte-blue paint with white detail work and the interior is made from snow-colored leather. Debuting in 2013, this Veyron was the second Veyron to come out of the companies “Legend Editions” series. This Veyron was made to commemorate Jean Bugatti, the son of founder Ettore Bugatti. This vehicle took its roots from the Type 57SC Atlantic and it features a black carbon fiber finish with platinum hardware. This limited edition Veyron was priced at a cool $3 million. This Veyron was a special one-off that was made to commemorate the Chinese Year of the Dragon back in 2013. Featuring extensive use of white coupled with the premium red leather interior, this Veyron was quite the looker. There are many unique pieces on this Veyron that depicts dragons. The model was based on the Grand Sport Veyron which is one of the higher performing models. This is the first Legends Edition Veyron that Bugatti produced and it certainly is worth of a place on our list. The vehicle was made to celebrate Jean-Pierre Wimille who was a Bugatti racing driver that won the company two victories at Le Mans in 1937 and then again in 1939. Those wins helped established the brand as a premium automobile company that was to be reckoned with. This Veyron featured a carbon-fiber exterior and a unique black and blue paint job. It is based on the 16.4 Grand Sport Vitesse and only six units were produced. By now you’re probably realizing that Bugatti’s Legends Edition Veyron are some of the best and the most desirable models that have ever been produced. This is the fourth model from the Legends Edition series. Like some of the others it is based on the Grand Sport Vitesse Veyron which is one of their highest performing models that can accelerate from 0-60mph in 2.6 seconds. This model was created to celebrate Jean Bugatti and it features a unique two-tone paint job and matching interior. Jean created the elephant logo that was used on older Bugatti’s and that elephant is found throughout the vehicle. This Veyron was made to honor Meo Costantini who was one of the most decorated Bugatti racers in the history of the brand. He captured many wins in his Bugatti Type 35 and that vehicle became one of the most successful race cars of all time. The L’Or Blanc Edition Veyron is next up on our list, and as you can see it is visually probably the most striking and unique Veyron the company has put out. This vehicle was produced in collaboration with Königliche Porzellan-Manufaktur Berlin, a German porcelain company. So this Veyron also makes extensive use of real porcelain which makes it extremely unique. As the name somewhat suggests, the World Record Edition Veyron is the fastest Veyron that Bugatti has ever made and the fastest production car of all time, which is why we have it at number one. Based on the Super Sport Veyron, Bugatti only produced just five of these amazing vehicles. For a long time it was the fastest car in terms of acceleration, only recently to be beat out by the Porsche 918 and the LaFerrari. The car can accelerate from 0-60mph in just 2.4 seconds and has a top speed of 267.8mph which means it is still the fastest street legal production car that has ever been made in terms of top speed.